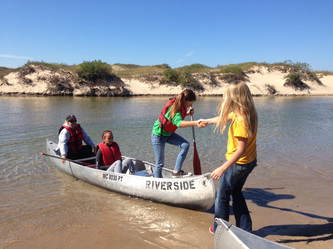 ​"Area Students Paddle the Platte River and Learn to Leave No Trace"
During the last week of September, the Benzie Conservation District, with several community partners, provided local middle school students an opportunity to learn about environmental stewardship first hand through canoeing the Platte River and seeing the annual salmon run. All of the sixth graders from Benzie Central and the seventh graders from Frankfort-Elberta Schools take part in this annual event. 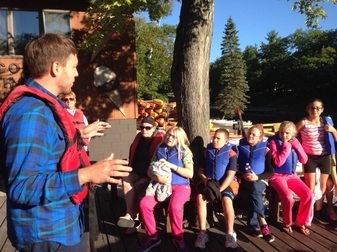 These river trips are coordinated by John Ransom, conservation specialist with the District, along with school personnel, National Park Service, Riverside Canoe Trips, Benzie Fishery Coalition, Michigan Department of Natural Resources, and volunteers. 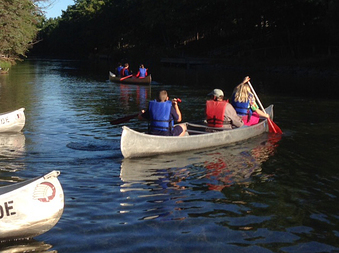 These trips would not be possible without the generous support of Riverside Canoe Trips, which provides all necessary canoes and equipment required for the trip down the river. Volunteer Ed McIntosh, president of the Benzie Fishery Coalition, speaks every year to the Benzie students about his work to protect the local salmon, rivers and watersheds. As an elder in the community, he knows he won’t be around forever. So, these trips are a chance for him to inspire the youth to play their part in preserving our county’s natural resources. “I have been carrying this torch. Now I want to pass it on to you. Who’s willing to carry it?” said McIntosh. To this, the hands of the students, teachers, and volunteers go up in the air. These annual ‘Leave No Trace’ programs offer students the learning experience of how to tread lightly in their watershed. It is the educators’ goal that the students will come away with a sense of ownership of the places they visited so they will utilize, appreciate and protect them in the future. The ranger from the National Park Service covers the seven principles of Leave No Trace outdoor recreation. The youth practice the principles of “respect wildlife,” “trash your trash,” “leave what you find,” and more. This one-of-a- kind county project educates students about the river ecosystems and the ecological and economic importance of a healthy river system and the presence of salmon in the Great Lakes. It also introduces the kids to the importance of awareness and stewardship of our natural resources. The educational experience doesn’t end when the youth finish the canoe trip: it continues into the fall and through the winter in the classroom, where the youth raise salmon fingerlings, which they later release into the wild. Michigan’s 80 Conservation Districts are responsible for educating residents on good conservation practices. They encourage good stewardship of natural resources. Districts coordinate with federal and state agencies, local government and community members to prepare long-range and annual plans to address specific conservation needs of the area. Priorities include protecting natural resources, maintaining productivity, and educating on stewardship practices. Michigan’s Conservation Districts are referred to as “gateways” to natural resource management for their local communities. They provide links between landowners and a host of conservation service providers. Contact the Benzie Conservation District, 231-882-4391, or aime@benziecd.org for more information.